How do I make my 14Fathoms file faster and more responsive? Move the file to your computer’s desktop. Running from a network drive and/or a VPN can cause A LOT of latency. Once you are finished working on the Excel file, move it back to the network drive. Close unnecessary tabs in all web browsers. 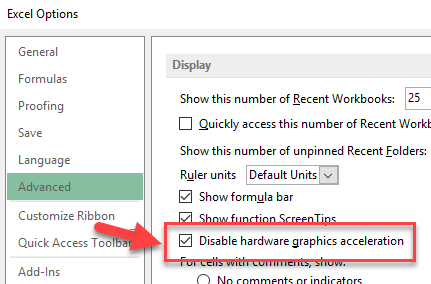 Do not stream music or videos while working within Excel. Check that all the programs in your Windows system tray are necessary. 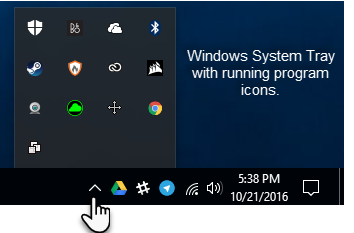 If they do not need to be running, right-click to close them. If you are not sure what the programs are for, you should contact your IT department. Any programs that you close should restart when you reboot your computer. 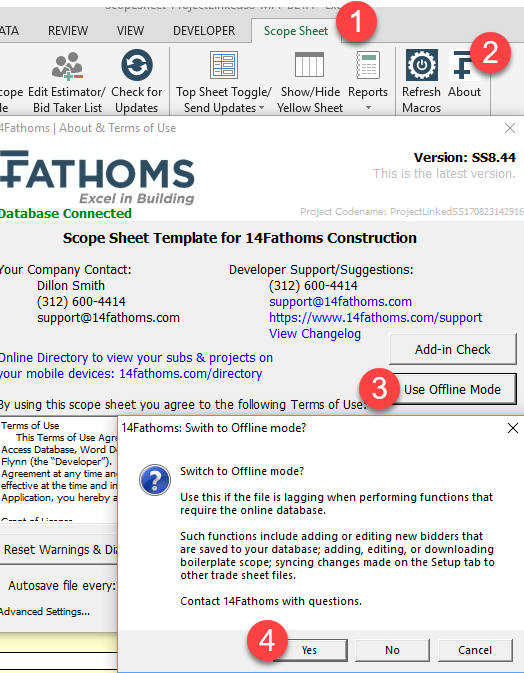 Make sure your 14Fathoms’ calculation mode is set to Auto in the 14Fathoms’ About box (not in the built-in Excel calculation settings). See this FAQ for details. 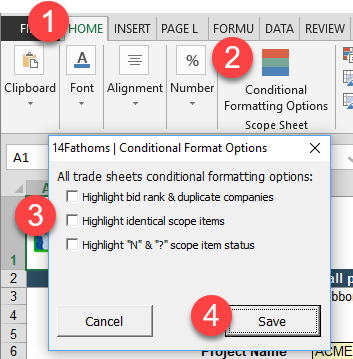 Turn off conditional formatting: Click Home in the toolbar > Conditional Formatting Options > Select your formatting options > click Save. Change your default printer to “Microsoft XPS Writer” or a PDF printer. This sounds odd, but Windows and print drivers in Excel are known to slow things down. Restart your computer and only open the Excel files you need to work with at the moment. If the above doesn’t help, please contact us, and we can provide more information to improve your use of Microsoft Excel. ← How do I edit the company Master Bid List or Master Scope Sheet Template? What settings can be changed?